Many of us who have pets already know - Animals can understand our feelings. They understand what we want. But did you know that you can understand the feelings and desires of your animals as well? Did you know that you too can understand the words  they never speak but mean to say? And did you know that you don't have to say anything out loud, because your pets can read your mind? Yes, it is true. Animals are very good at understanding non-verbal behavior. But you shouldn't limit yourself to that. You can learn to go much beyond regular non-verbal communication with your lovely pets. You can interact with them telepathically. You can have a conversation with them. 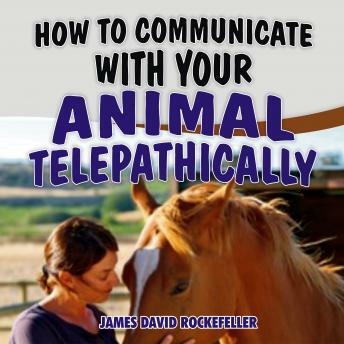 Through telepathy, you can use your natural intuition and psychic abilities to communicate with any species. Animal communication is a very natural thing. We all know how to do it. But since we've never used this skill, we have forgotten just how to talk to our animals. The intention of this audio is to introduce you to the concept of animal communication. How do you get started? How do you need to prepare? What things do you need to keep in mind? How can communicating telepathically with your animals help you? So, let's get started and let's make our animals our closest friends!